School Project: A Wine Pairing Dinner featuring Leek Bread Pudding. Tonight I turned in my big school project for the semester. 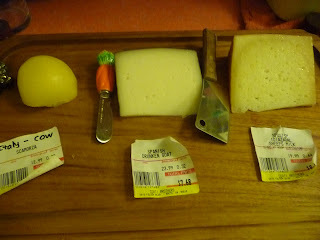 I planned and plotted a 4-course menu with an appetizer and wines to go with each course. I spent the weekend after Thanksgiving shopping and cooking and cleaning and invited people over to eat and drink my handiwork. It all went pretty swimmingly. Last night I had to actually write the paper and when it was done it just looked so….puny. After all of that work, all I get is 2 pages? Oh well. These are the wines we had with our meal. 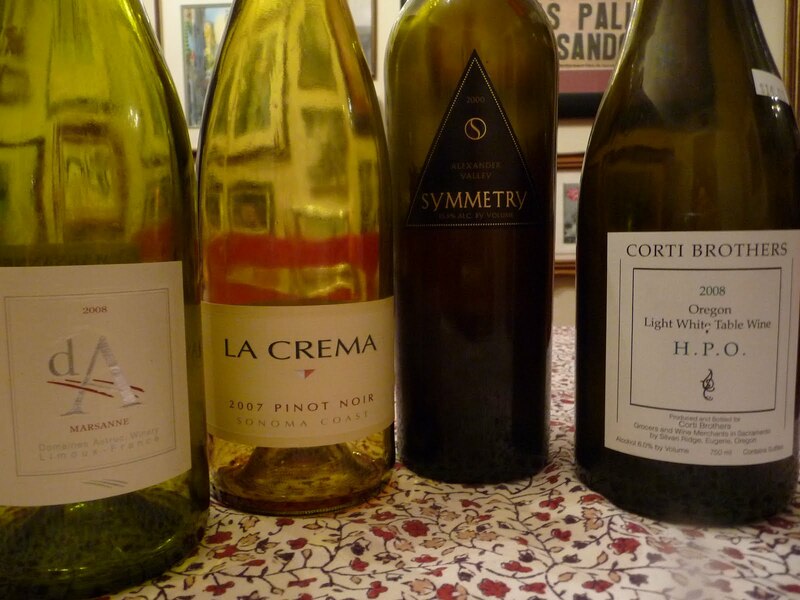 All were delicious, but I was surprised that I, an avowed red wine drinker, really really loved these white wines. The recipe I want to share with you today is from my NEW cookbook–I know! I can’t be stopped! It’s Ad Hoc by Thomas Keller. I got it at the Costco for only $30. I couldn’t resist it. 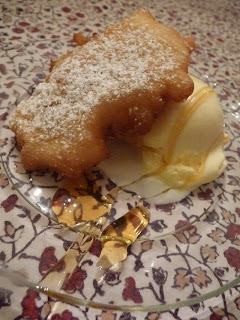 And after tasting this recipe I’m sure glad I didn’t resist it. 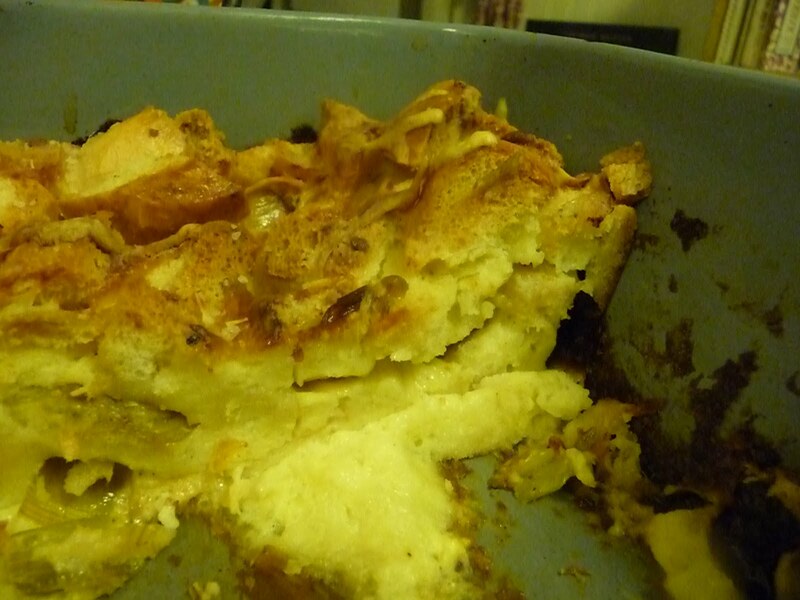 Savory leek bread pudding. Unbelievable. Didn’t take a picture of the groceries again, you’ll have to make do. Toast your bread cubes. The actual recipe calls for brioche or Pullman loaf, but I used French sandwich rolls. G had worked an event at Raley Field and brought home an enormous sack of these rolls. 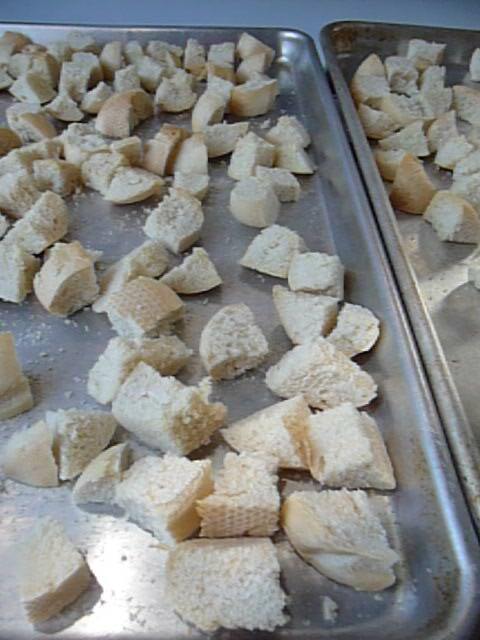 12 cups of bread cubes did not make a dent. Does anyone need any rolls? Let me know. Cut the leeks into 1/2 inch thick rounds and soak them in water to get the dirt out. 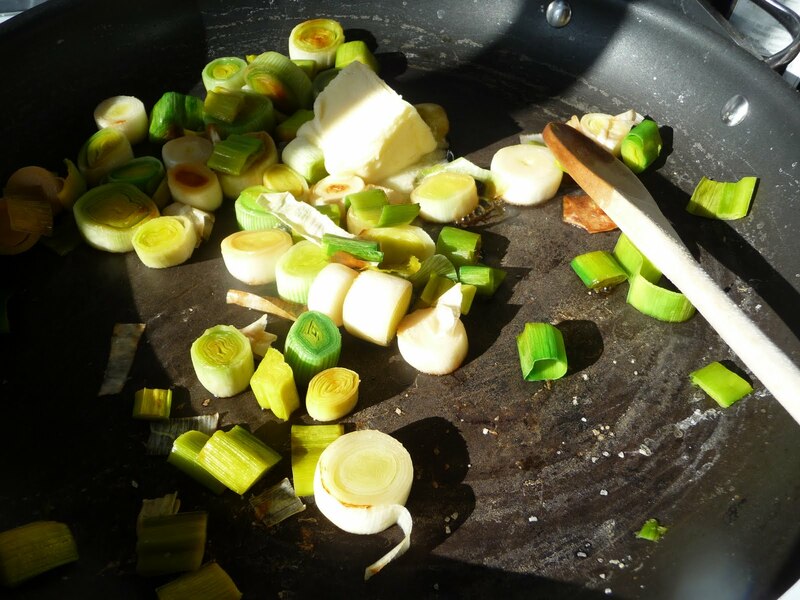 Heat a saute pan over medium-high heat, lift the leeks out of the water, drain them and add them to the pan. 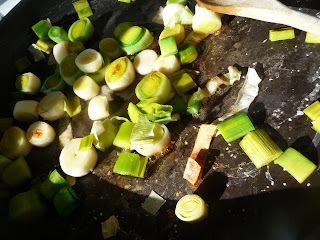 Season the leeks with salt and cook for 5 minutes. While the leeks are doing their thing, make a parchment lid. 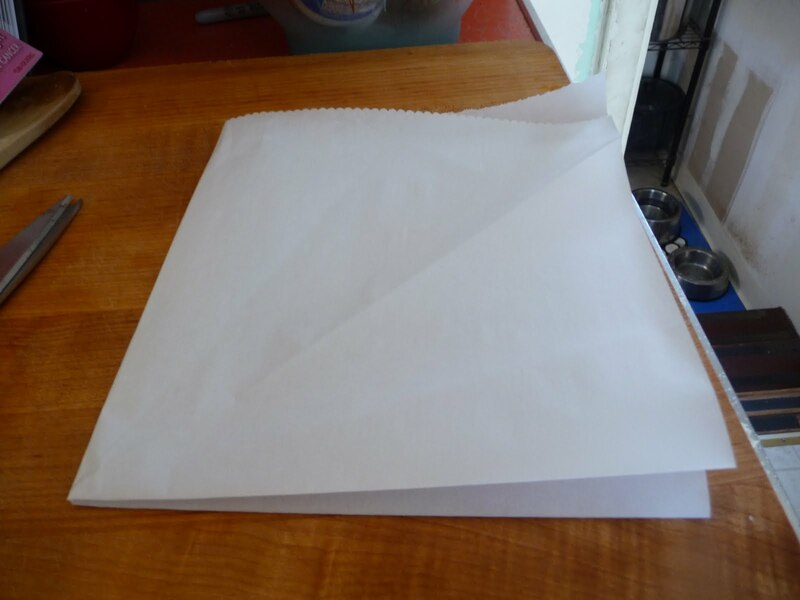 Get a sheet of parchment, the size of your pan, or a little bigger. 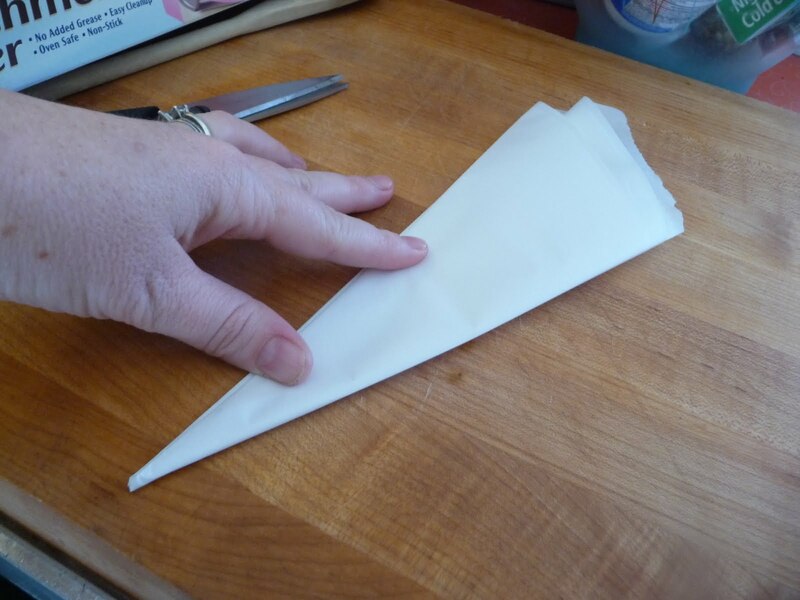 Then fold twice more so you’ve got kind of a paper airplane looking thing. Take it over to the pan and put the point in the center of the pan. Mark or fold where it hits the edge of the pan. 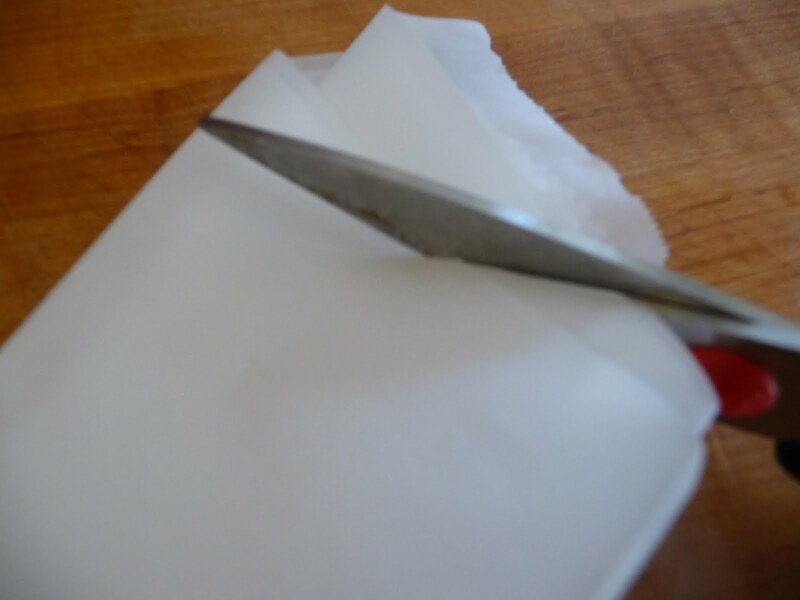 And trim the edge of the parchment so it’s the same size of the pan. 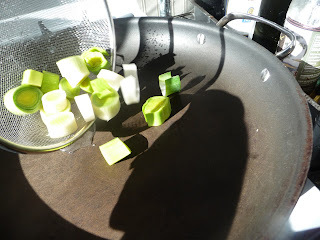 By this time, the leeks will have softened. Lower the heat to medium-low. 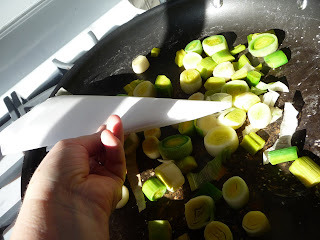 According to Chef Keller, the leeks will release some liquid but mine did not. I added a couple of tablespoons of water. Stir to emulsify. 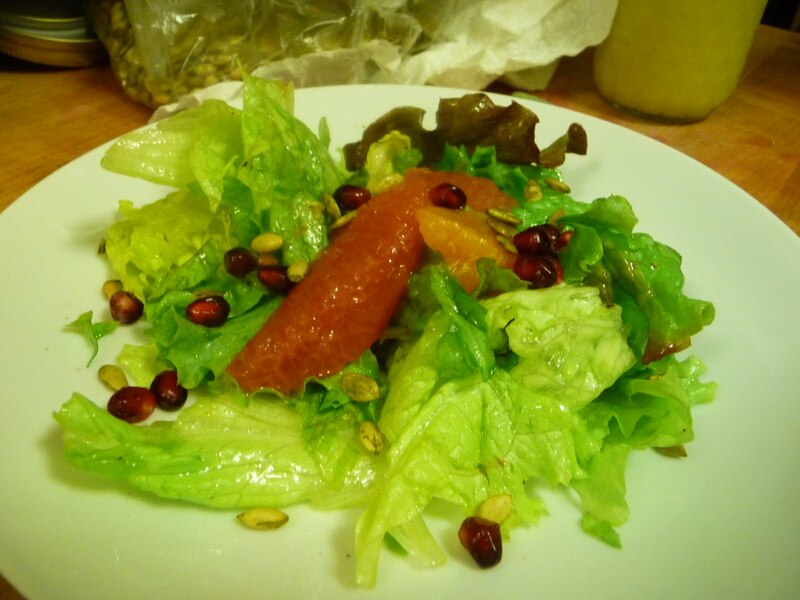 Season with pepper to taste. 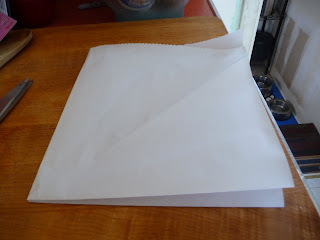 Add your handy dandy parchment lid. Cook, stirring once in a while, for about 30 minutes, or until leeks are very soft. 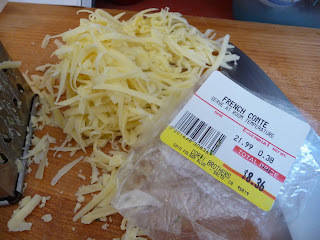 While that cooks, grate a cup of Comte. And make the custard. Eggs, milk, cream, salt, pepper and nutmeg. 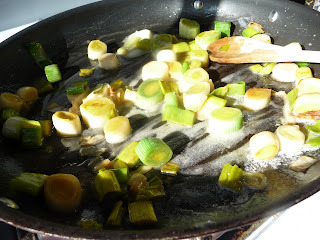 Look at those lovely caramelized leeks! 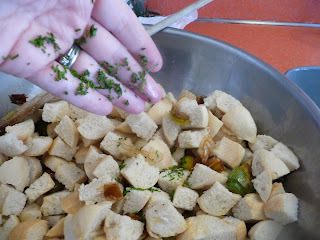 Mix the croutons, leeks and herbs in a large bowl. 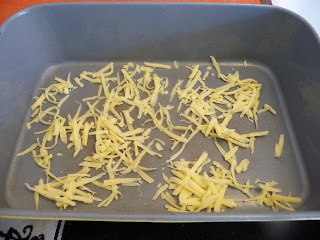 In a 9×13 ovenproof dish, sprinkle 1/4 cup of the cheese. 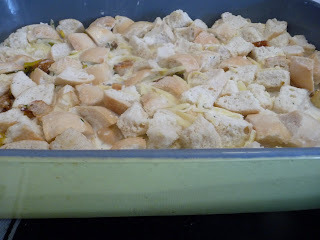 Add half of the croutons and another 1/4 cup cheese. 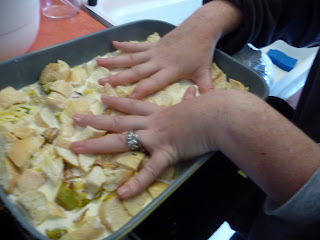 Then add another layer of croutons and another 1/4 cup cheese. 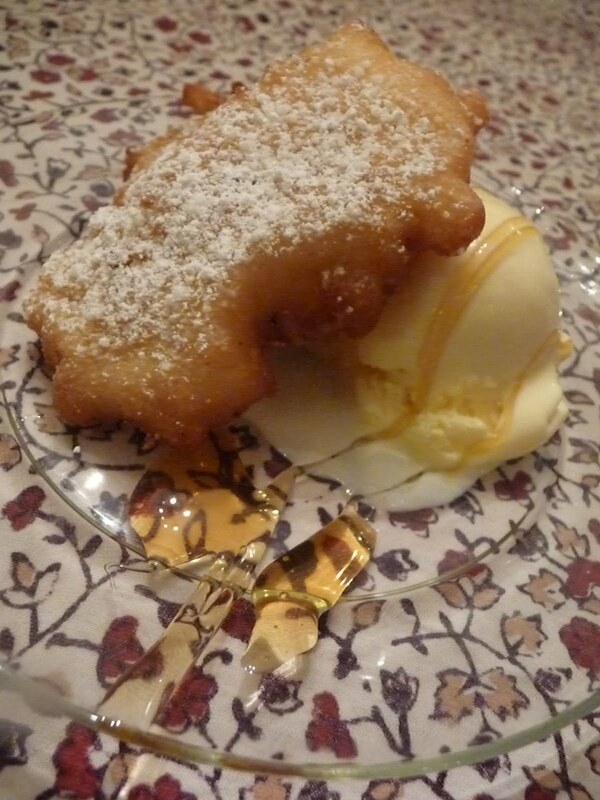 Pour in enough custard to cover the bread. Squish it down with your hands so that it soaks in the custard. 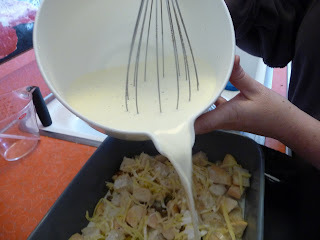 Let it soak for 15 minutes, then add the remaining custard and cheese. Sprinkle with salt. Bake for 1-1/2 hours or until it feels set in the center and the top is brown and bubbling. Now just try not to devour it before you take a picture of it. Paired with 2008 Revolution Wines Moonlight Rose, Capay Valley.13.8%. 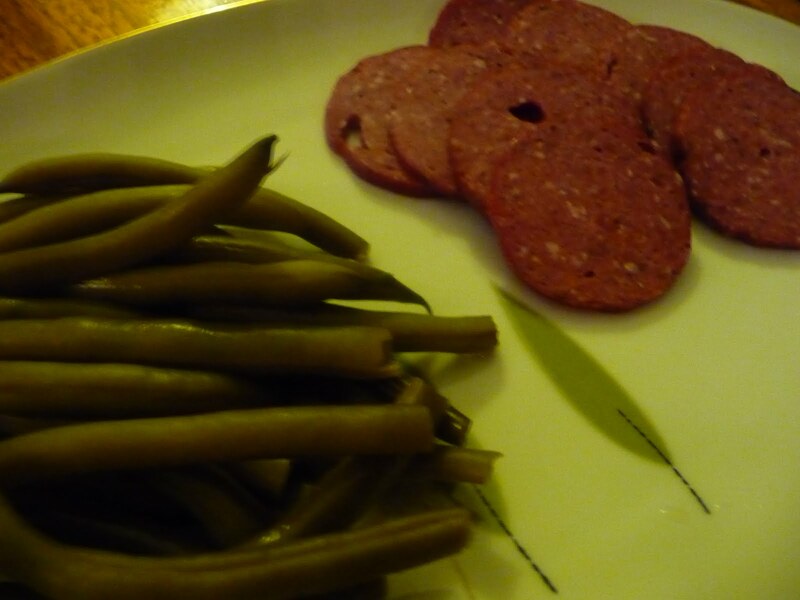 I chose this wine because I had it left over from a wine club package, and I thought a dry rose would work well with the salami.This wine was a little sweeter than I remembered it and although it tasted fine with the appetizers, a dryer wine would’ve been preferable. 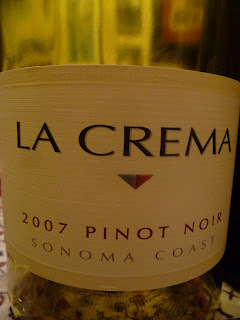 It was a dark rose color, clear, and had a raspberry and cherry aroma.It was made from a blend of 50% Merlot, 25% Grenache and 25% Mourvedre.It had a very slight sparkle to it. Baby lettuce salad with pink grapefruit and mandarin orange segments, pomegranate seeds, pepitas, and honey vinaigrette. 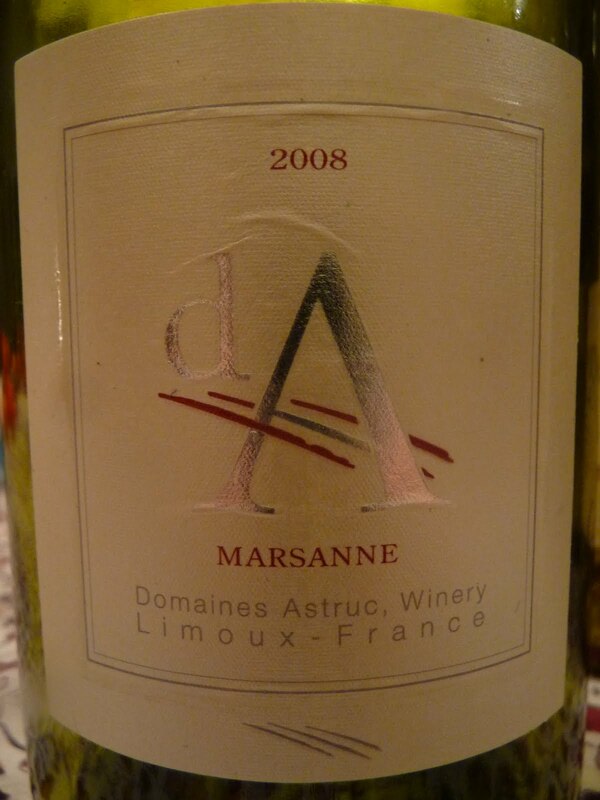 Paired with 2008 dA Marsanne.Domaines Astruc, Limoux-France.12..5%. I chose this wine at Corti Bros for a few reasons—the price was right, and the label touted its good acidity and honey notes.I felt this would work well with a crisp salad with sweet citrus fruit and the honey in the vinaigrette. 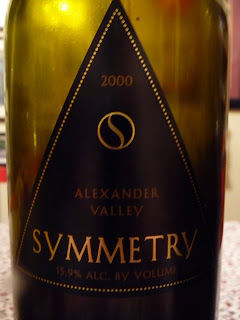 The wine was clear, and the color was golden.It smelled a little fruity and like pear.I definitely picked up the honey notes.This wine worked well with our first course.I would purchase this again.Only $8.99. 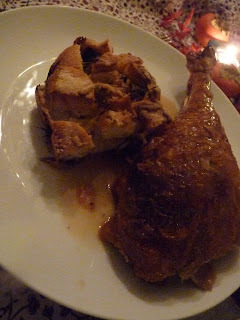 Pancetta and sage roasted turkey with leek bread pudding. Paired with 2007 La Crema Pinot Noir, Sonoma Coast.13.9%. This is a wine that I buy fairly frequently at Costco.It normally retails for about $25 but they sell it for around $16.The color was burgundy and was clear.This wine had an aroma of cherry, oak and spice.It tasted a little like anise and the cherry flavor was strong.It paired well with the turkey and pancetta, but the turkey could’ve stood up to something a little more peppery, like a syrah. 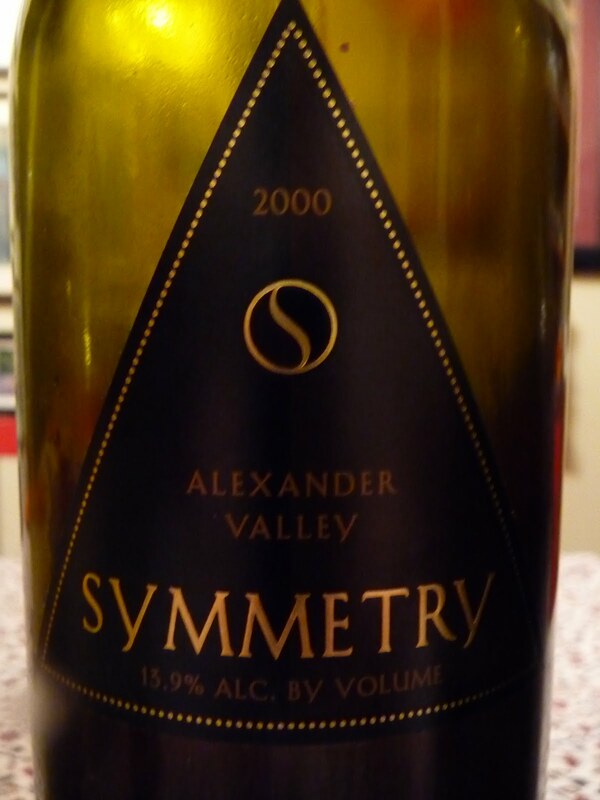 Symmetry is made from 62% Cabernet,27% Merlot, and11% Cabernet Franc.This was a special wine that my husband brought home from his job as a bartender at the Solon Club at Raley Field.It retails from $50.It was a deliciously rich wine, deep burgundy in color.It smelled of plum, blackberry and oak.It had a rich and velvety mouthfeel and was decadent with the creamy cheeses.We have another bottle that I will store for a few more years and see what develops. Paired with Corti Brothers 2008 H.P.O. Light Table Wine.6%. 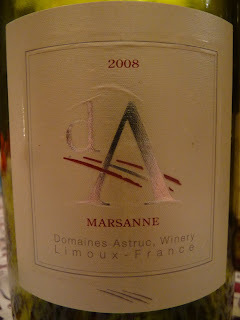 This wine was clear and straw-colored.It had a very floral and fruity smell, like ripe melon, white peaches or lychee.It was lightly acidic and had a slight sparkle. H.P.O. 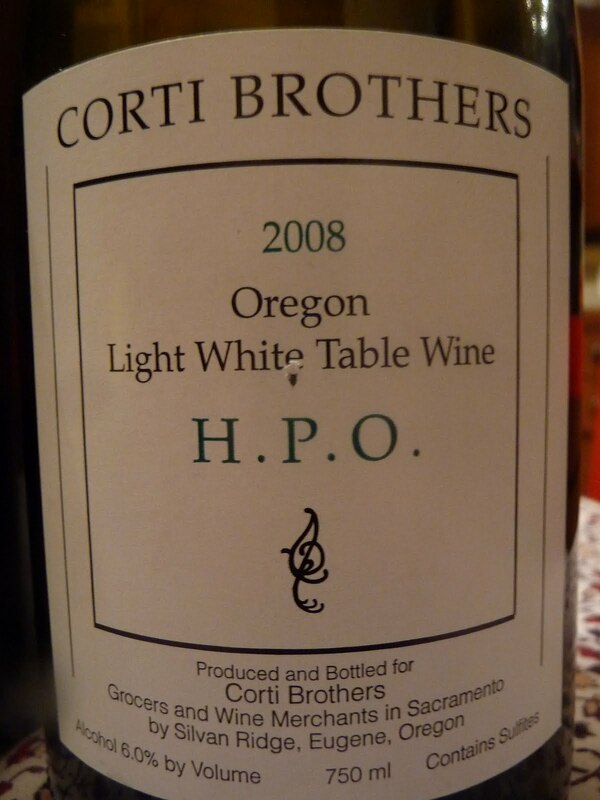 is made from theearly Muscat variety, under the Corti Brothers’ label calling the wine H.P.O. forHarold Paul Olmo, the 97 year old emeritus professor of viticulture at the University of California, Davis, who is the variety’s creator. This is the perfect summertime wine, dessert wine and probably the perfect anytime wine.I enjoyed it very much.This is a release I look forward to annually.It retails for $14.99. I think that the pairings were a success. I have purchased wine to go with meals before, but never really put much thought into pairing with each course. It was a fun challenge and I was very proud and happy (and I won’t lie–a little surprised) of the good results. 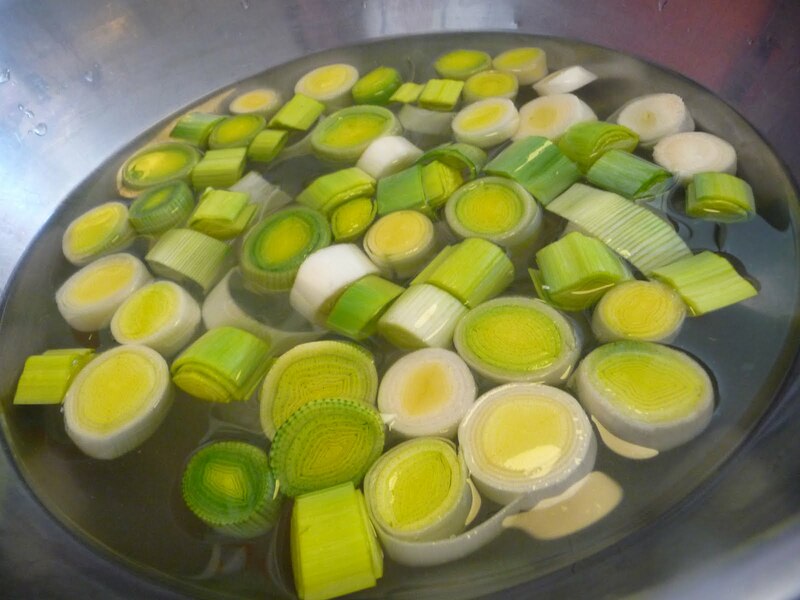 Put the leek rounds in a large bowl of tepid water and swish so that any dirt falls to the bottom of the bowl. 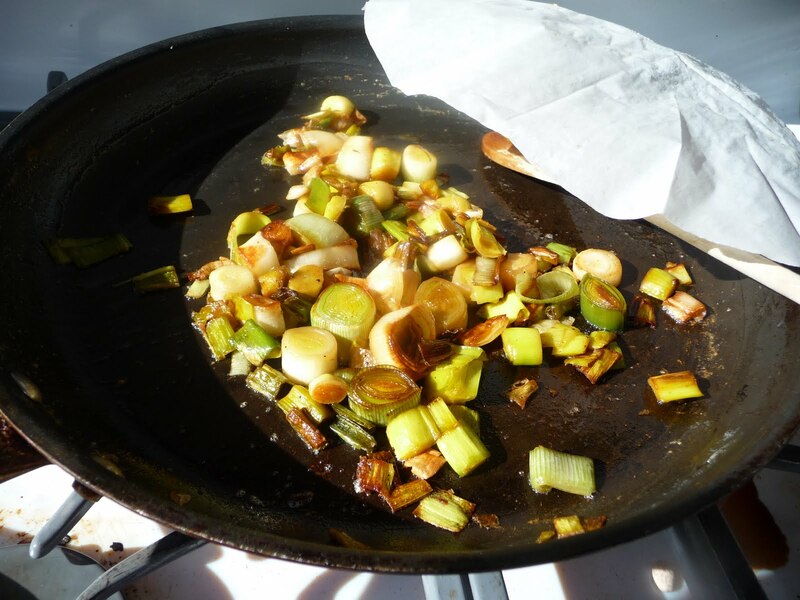 Set a medium saute pan over medium-high heat, lift the leeks from the water, drain, and add them to the pan. Season with salt and cook, stirring often, for about 5 minutes. As the leeks begin to soften, lower the heat to medium-low. The leeks will release liquid. Stir in the butter to emulsify, and season with pepper to taste. 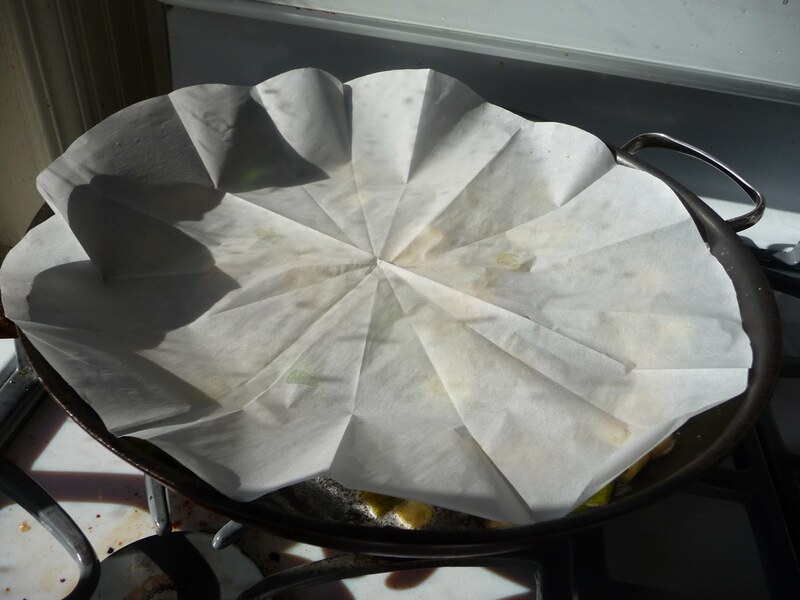 Cover the pan with a parchment lid and cook, stirring every 10 minutes, until the leeks are very soft, 30-35 minutes. If at any point the butter breaks or looks oily, stir in about a tablespoon of water to re-emulsify the sauce. 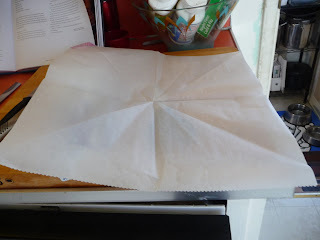 Remove and discard the parchment lid. Meanwhile, spread the bread cubes on a baking sheet and toast in the oven for about 20 minutes, rotating the pan about halfway through, until pale and gold. Transfer to a large bowl. Leave the oven on. Add the leeks to the bread and toss well, than add the chives and thyme. Lightly whisk the eggs in another large bowl. 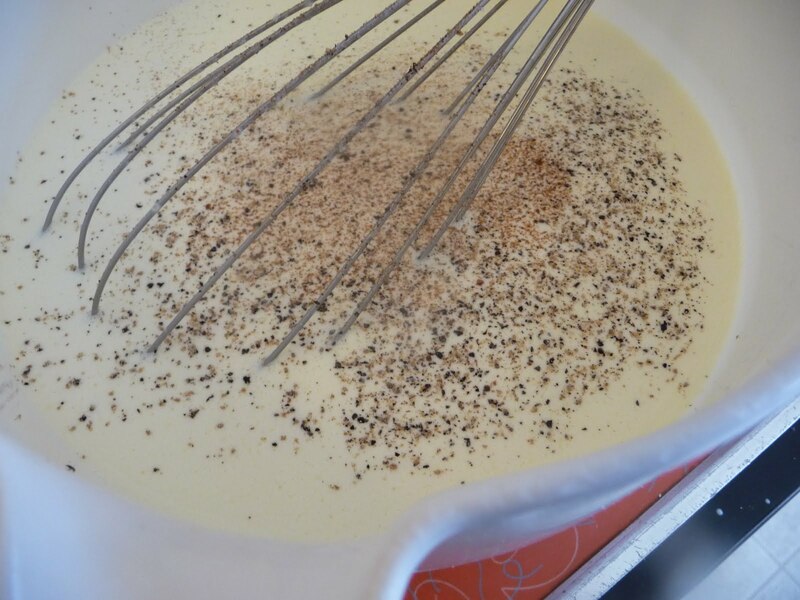 Whisk in the milk, cream, a generous pinch of salt, pepper to taste and a pinch of nutmeg. 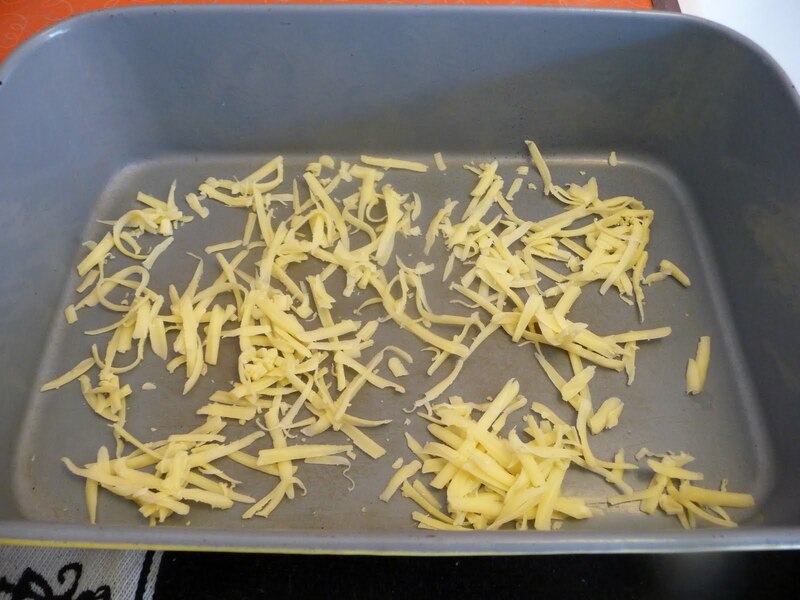 Sprinkle 1/4 cup of the cheese in the bottom of a 9x13 inch baking pan. 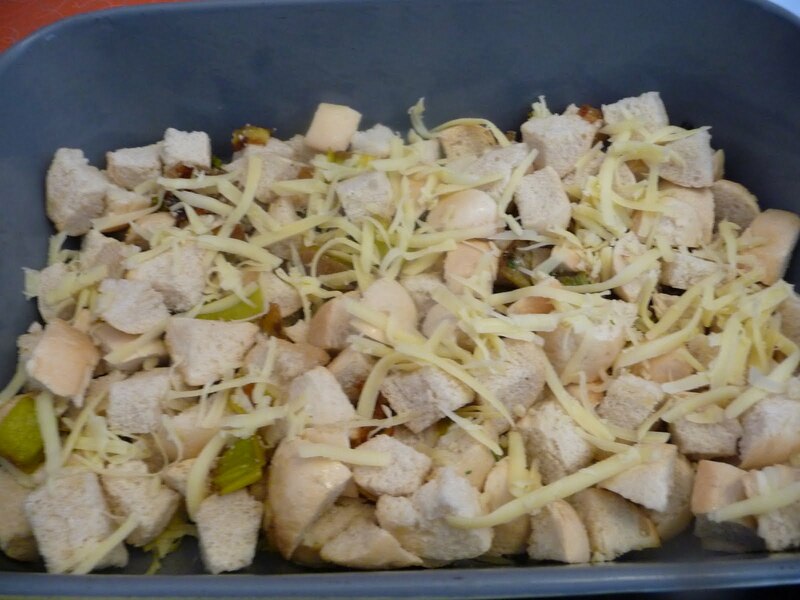 Spread half the leeks and croutons over and top with another 1/4 cup cheese. Scatter the remaining leeks and croutons over and top with another 1/4 cup cheese. Pour in enough of the custard mixture to cover the bread and press gently on the bread so it soaks in the milk. Let soak for about 15 minutes. Add the remaining custard, allowing some of the soaked cubes of bread to protrude. Sprinkle the remaining 1/4 cup of cheese on top and sprinkle with salt. Bake for 1-1/2 hours, or until the pudding feels set and the top is brown and bubbling. Serves 12 as a side dish, 6 to 8 as a main course.